We all know sharks can be dangerous. But most of us don’t spend our waking hours worrying about sharks because we rarely encounter them. This might change if you had to swim or surf in the sea. But even then, your chance of being attacked by a shark is extremely low. In this example, the shark is the hazard (or, w.r.t. toxicology, a toxic substance). Exposure to sharks only occur when you enter the sea. While there is little data on how many people enter the sea every year, it is conceivable that millions do. There are less than a 100 shark attacks every year. Therefore, the risk (or likelihood) of being attacked is extremely low. But if you enter a sea infested with human-attacking sharks, your risk increases. On the other hand, for an average person (one of the nearly 8 billion people worldwide), this risk is lower. In short, Risk = Hazard (or Toxicity) x Exposure. It is the likelihood of a hazard causing harm. There is no risk if there is no hazard or no exposure. 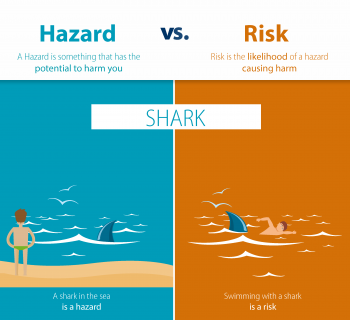 And the magnitude of risk is determined by the hazard (say, shark vs dolphins) and exposure (entering a sea vs not entering). Since shark attacks are so rare, we need not worry about the risk posed by them. But what about pesticides? Or alcohol? How do we find out if the risks they pose are acceptable or not? The U.S. Environmental Protection Agency (USEPA) uses something called a Margin of Exposure to find this out. They do this particularly for pesticides. No Observed Effects Level (NOEL) = The highest concentration or dose of the pesticide that doesn’t cause an adverse effect. Estimated Exposure Dose (EED) = The combined exposure dose of the pesticide that humans get from food, drinking water and residential use. Since humans cannot be given pesticides and tested in the traditional sense, animals are instead used to generate NOELs. Typically, rats and mice are given different doses of the pesticide and NOEL is identified and extrapolated to humans. (Read section Uncertainty.) EED is calculated using some of the methods described in the section How to estimate chemical exposure. In general, if the MOE is equal to or greater than 100, then the pesticide is assumed to be safe. This means that the exposure dose should be at least a 100 times lower than the highest dose that is safe. If the MOE is less than 100, the pesticide is assumed to cause a risk. Such MOEs are called deterministic because a single exposure and hazard concentration has been identified for the entire human population. The reality, of course, is different. Humans are exposed to different concentrations of a pesticide and show different susceptibilities to a pesticide. Hence, there is an increasing push to use probabilistic MOEs. This means using multiple exposure and hazard concentrations and finding the probability of risk for the whole population. This could translate to something like 80% of the population are not at risk from the pesticide, while 15% are at some risk and 5% are at a high risk. Such information will help us make better decisions and identify ways to reduce the risk to susceptible individuals in the population (either by lowering their exposure or by replacing the hazardous substance with a less hazardous one). Several studies have looked at how the public and experts rank risks of various activities and technologies. Below is a table from one such study (rank 1 is the riskiest and rank 30 is the least riskiest). Ranking of risks by laypersons and experts. Image source: Federal Emergency Management Agency, 2007. Adapted from Slovic et al., 1979. So one probably shouldn’t approach laypeople to identify risky technologies or activities. But it is important not to dismiss the concerns of the public as a fair regulatory decision on any chemical can only be made if all parties are heard. More on this later!